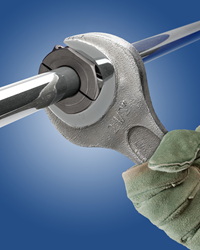 Stafford Wrenching Collars fit onto standard shafts to let users add torque by using an open-end wrench while preventing damage to the expensive shaft. Available in 15 sizes to fit shafts from 1/4” to 3” O.D., Stafford Wrenching Collars are offered in steel, stainless steel, and aluminum. These wrenching collars help free frozen shafts and are extremely effective for alignment. Stafford Manufacturing Corp. has introduced a line of two-piece shaft collars that combine a smooth bore to protect valuable shafts with wrenching flats to safely provide added torque using an open-end wrench. Stafford Wrenching Collars fit onto standard shafts to let users add torque by using an open-end wrench while preventing damage to the expensive shaft. Ideally suited for maintenance and setup applications, these wrenching collars help free frozen shafts and are extremely effective for alignment. Available in 15 sizes to fit shafts from 1/4” to 3” O.D., Stafford Wrenching Collars are offered in steel, stainless steel, and aluminum. They can also be supplied with threaded-, hex-, and square bores. Pipe sizes from 3/8” to 1-1/2” are offered to free frozen pipe components. Stafford Wrenching Collars are priced according to size and material; supplied individually and in kits. Pricing is available upon request. Stafford Manufacturing Corp.Stafford Manufacturing Corp.